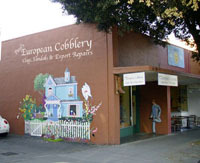 European Cobblery is a family owned and operated shoe store serving the bay area since 1942. A jewel of the peninsula, European Cobblery offers a full service shoe and leather repair shop. Renowned for our four generations of fine craftsmanship we specialize in high quality repairs and alterations from adding elastics to altering straps. Known for our detailed and meticulous work we are recognized for resoling and refurbishing shoes and leather goods. We not only offer in store drop off, but you may also send in your shoes and have them shipped back to you via UPS. We pride ourselves on fine craftsmanship and timely delivery. We are proud to be recommended by many luxury boutiques for repairs and alterations on their high end merchandise. Namely, Louis Vuitton stores across the bay area sending their patrons to us in lieu of sending their goods to the repair center in Paris. Nieman Marcus, Arthur Beren and Wilkes Bashford are among others of whom we appreciate their support. Rest assured your cherished shoes and handbags will be well taken care of at European Cobblery. We sell a plentiful array of fun, funky and comfort shoes all sure to be of the highest quality. Featuring the best selection of clogs in the Bay Area. We sell a plentiful array of fun, funky and comfort shoes all sure to be of the highest quality. Featuring the best selection of clogs in the Bay Area. We offer comfort shoes for anyone on their feet or on the go. From the basic all day clog to stylish heels. Our knowledge in shoes will help you find the perfect fit for your foot. At our stores we have a great selection of Scandinavian clogs featuring brands like Dansko, Troentorp, Tessa And Sanita. The clogs don't stop there, you can find clogs for anyone from the littlest to biggest feet in your house. You will find Your favorites such as, Keen, Privo, El Natura Lista, and several less known, well made treasures. Your one stop Flip Flop shop with a huge inventory of Reef, Rainbow, and Havaianas. And, of course a giant wall of the all colorful CROCS. You can always find a great bag, tote, or purse. Featuring a large selection of Sally Spicer Totes and handbags made in San Francisco, Ellington and other unique bags to insure you can show off your own personality outfitted in cute comfy shoes and a great bag.